Marie is a self-taught quilter. She has been making quilts as a hobby since 1970. Her quilts appeared in the West Branch Annual Quilt Walk. The quilt top looks great on the bed, but it's not done. Let's get it ready for quilting! Many quilters mark their quilt lines with chalk or other easily removable material before sandwiching the quilt. There are many patterns and methods of marking, and I will attempt to cover these in a separate article. This happens to be a queen-size quilt, measuring 90" X 108". If you send your quilt tops to someone who uses a long-arm quilt machine, they will probably provide you with the back and batting. 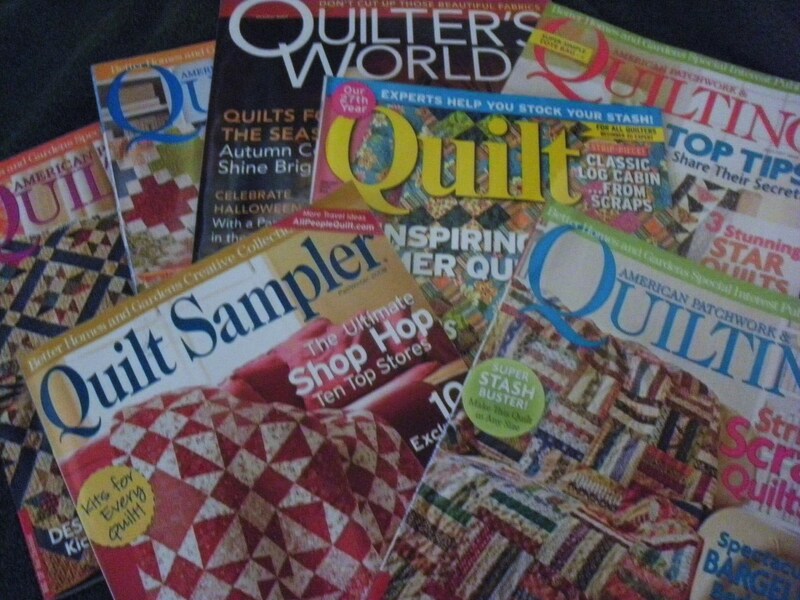 This article, however, is about do-it-yourself hand quilting. 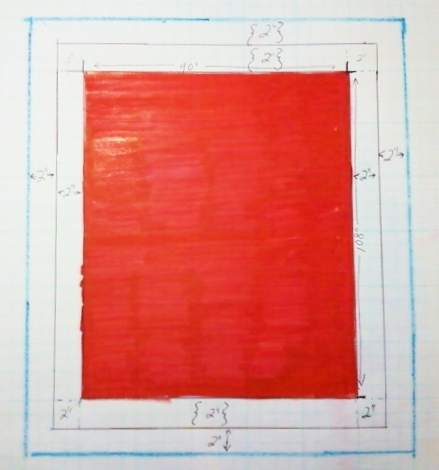 The section of the unfinished top is red, and the back has to be at least two inches larger on all sides for hand quilting. And the back has to be two inches (2") beyond the batting . . . The edges of the back are shown in blue. You are adding two inches PLUS two inches (4") on width and length for batting; an additional four inches to the batting size for the backing. The additional widths and lengths of the batting and back ensure there will be enough of each when you get to the outer corners in the final stages of your hand quilting. Also, if you need to straighten the fabric or batting a little, you've got the separate edges you can grasp for that gentle tug to smooth that particular layer. Looking at my square inches and converting that figure to square feet, I know I'm going to need 11,368 square inches of fabric for my back. So, it's time to assess my fabrics. 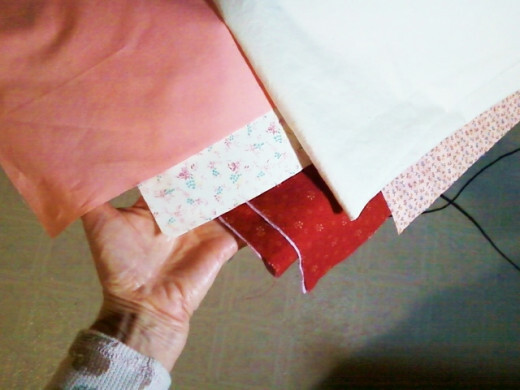 Here are the biggest pieces of my left-over fabric. 21 1/4" X 37 1/4"
32 3/4" X 41 1/2"
All dimensions were figured with 1/4" seam allowances deducted. Decimal places were rounded down to the lower hundredth. I see that I am short 2,046 square inches, or about 1 3/4 yard. So, the least expensive backing material is quilter's muslin. It's wise to add a quarter of a yard to allow for error, so it's off to the fabric store to buy two yards of muslin! I have my additional muslin, washed, ironed, and selvages removed. It's time to start contructing my back. Lay your quilt top on a large, clean surface, such as a floor or top of a table or bed. Starting at the center, place your largest piece of fabric, either with grain vertically or horizontally aligned. Do not sew anything. Using a combination of size and color, keep working outward with your fabrics, overlapping each section a little as you go for seam allowances, until the entire top is covered. Recheck the size of the back against the top. Add additional fabric strips along the edges, if necessary. Trim off any excess of the back that's MORE THAN four inches (4") beyond the top. Review the dimensions of your available fabrics. Order the fabrics in preferred color arrangement. Begin arranging the top "row" (different length fabrics will not align). 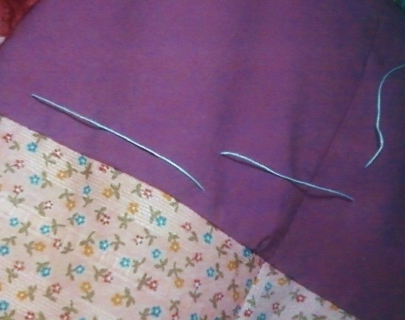 Leave 2-4" unstitched of seams that do not meet perfectly. Press each seam (light fabric to dark, if possible). Sew as many sections as necessary to get desired backing width. 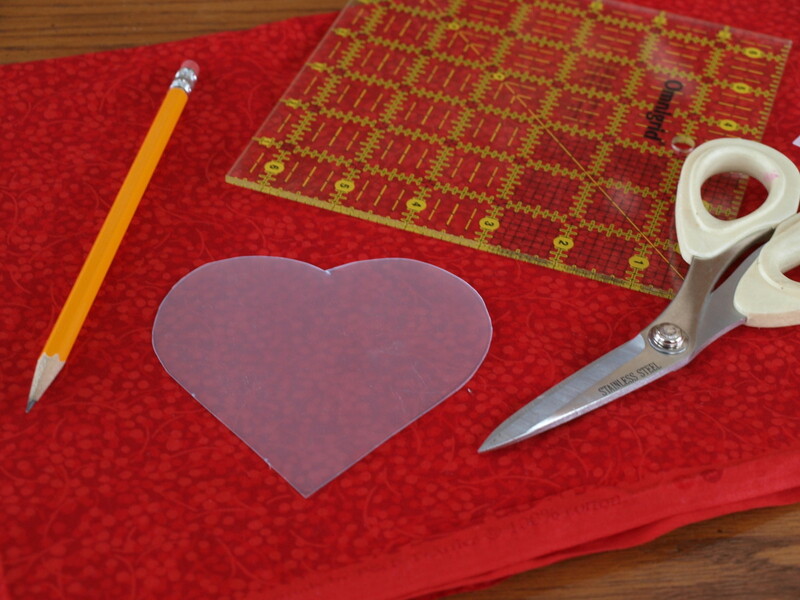 Horizontally sew pieces to short fabric sections; press seams as you go. Continue sewing previous seams that did not match, again allowing 2-4" unstitched for seams, once again, that may not match. Repeat this method, row-by-row adapting uneven seam matches, until you have reached the necessary back size. Trim off the excess back that goes beyond the necessary dimensions. A. 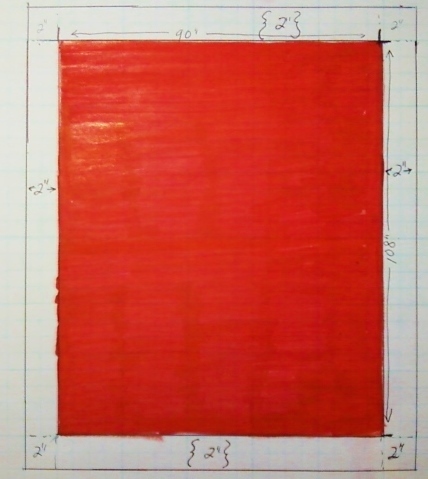 Following Method Two above, square off each row in accordance with the shortest piece. Do not sew rows together until you have sufficient vertical coverage (combines Method One). If you have a row with lot of smaller pieces, you can place that in the middle of the backing material. 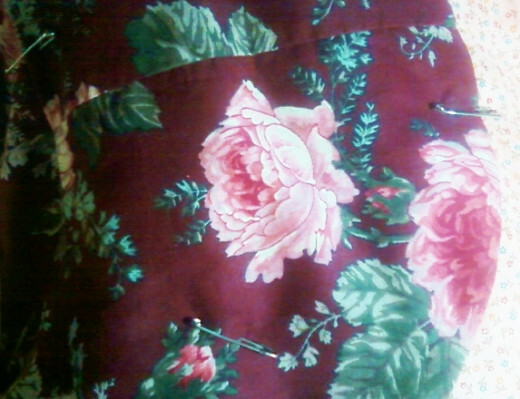 Again, press seams as you sew them. B. You can actually make a whole new quilt design for the back if you have no deadline. 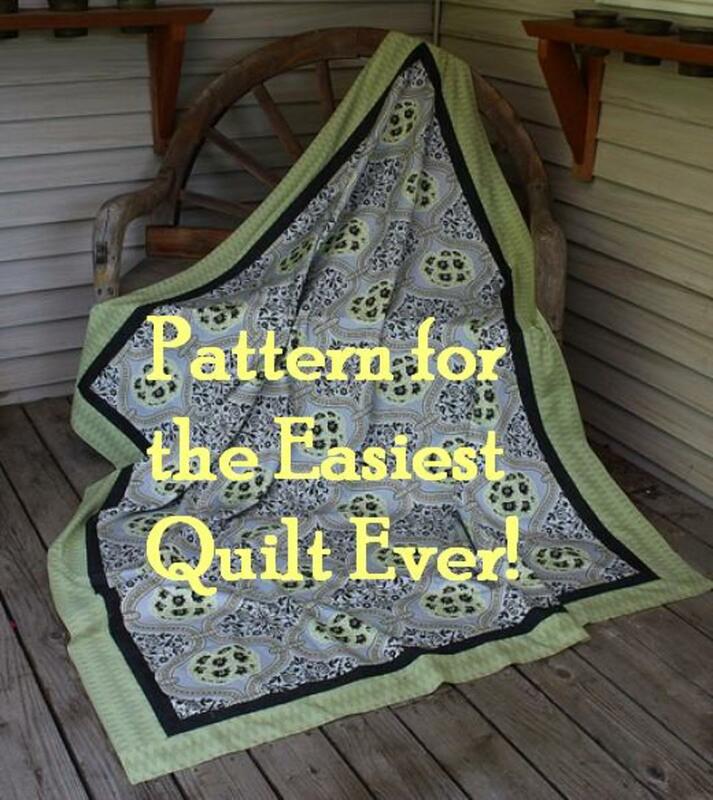 If you decide to do this, you will have a reversible quilt. Just be sure that your secondary design that's intended for the back has the additional four inches on each edge to ensure sufficient fabric when hand quilting. 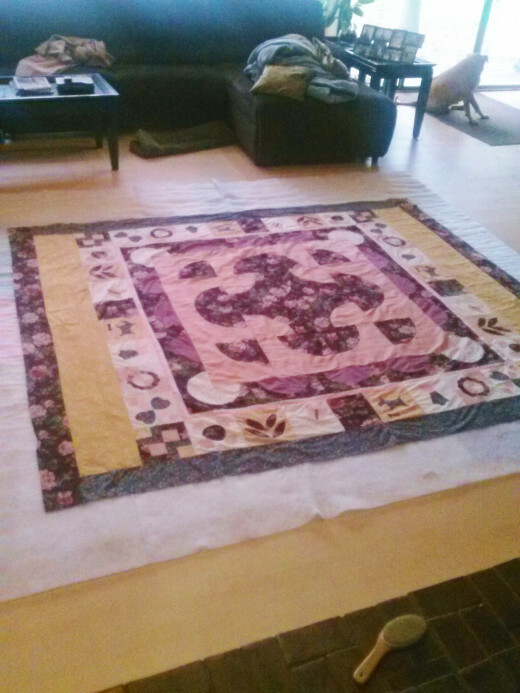 This is a partial view of my finished quilt back using Method 2. Some strips of dark green print fabric were added. 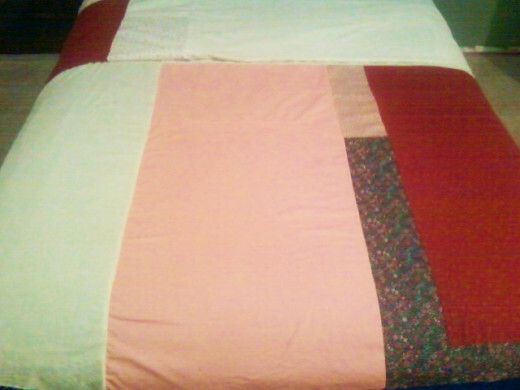 With the quilt back completed, the quilt can now be layered, or, as quilters say, "sandwiched." The batting is on top of the backing (wrong side up) here on this cleaned floor. A lint brush (right front) is useful in removing loose threads from the backing prior to spreading it. The quilt top finishes the layers. Batting and backing will be trimmed shortly after basting, which begins by rolling a corner (all layers) so center can be reached. 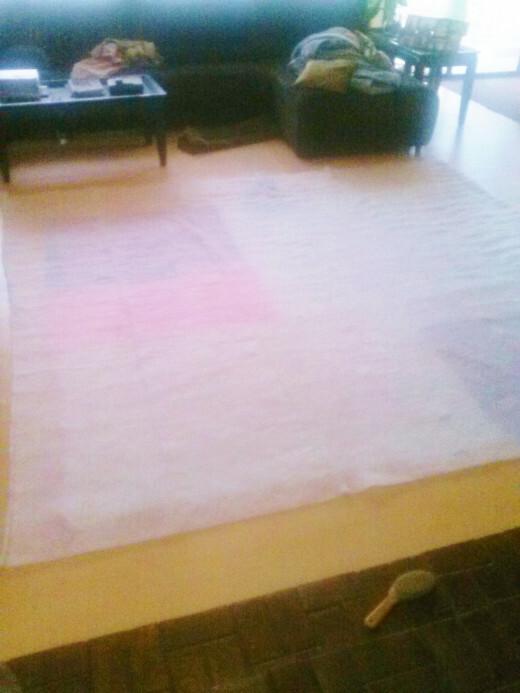 Because of the large size of my quilt, sufficient floor space had to be cleared and cleaned. 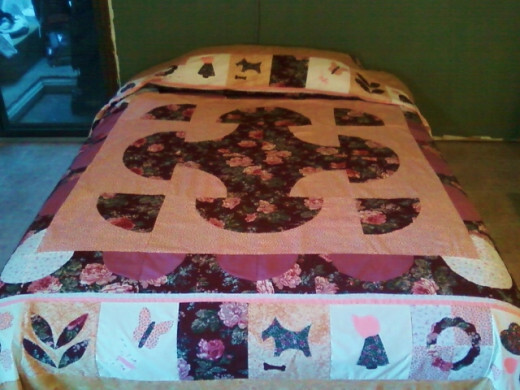 Here is a picture of the quilt back with the batting atop it. when laying the back, you have to be sure the right side of the fabric is down. There is a pillow method for finishing quilts where all the right sides of fabric have to be to the inside, but that method is not covered in this article. Essentially, the batting clings to the back, especially when seams are involved. Once the top is in place, the basting process can begin. 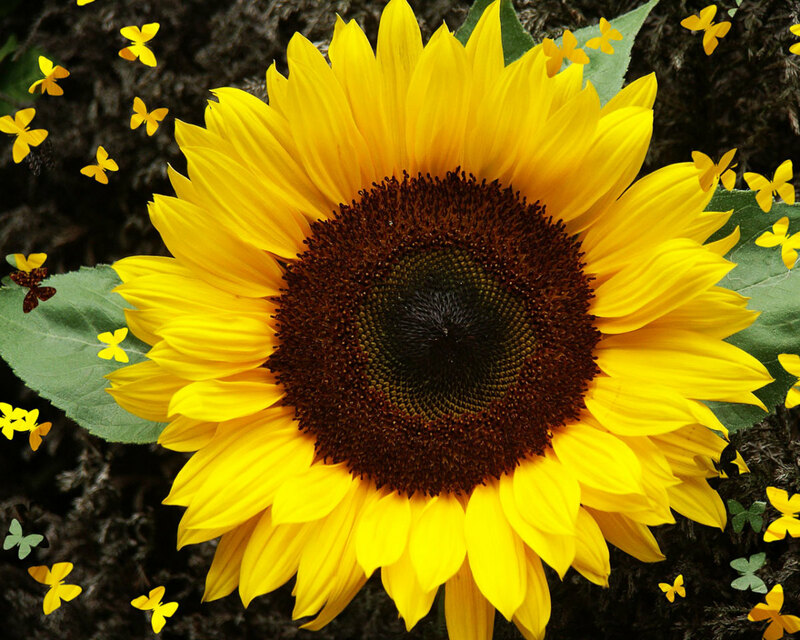 Start from the center. This is done by rolling all three layers together from one tip of the quilt-in-progress. When the rolled portion is near the center, the underside is easily accessible with one hand while the other pushes the pinpoint or threaded needle through all three layers. The free hand, by feel, makes sure the pin or needle has permeated all the layers. 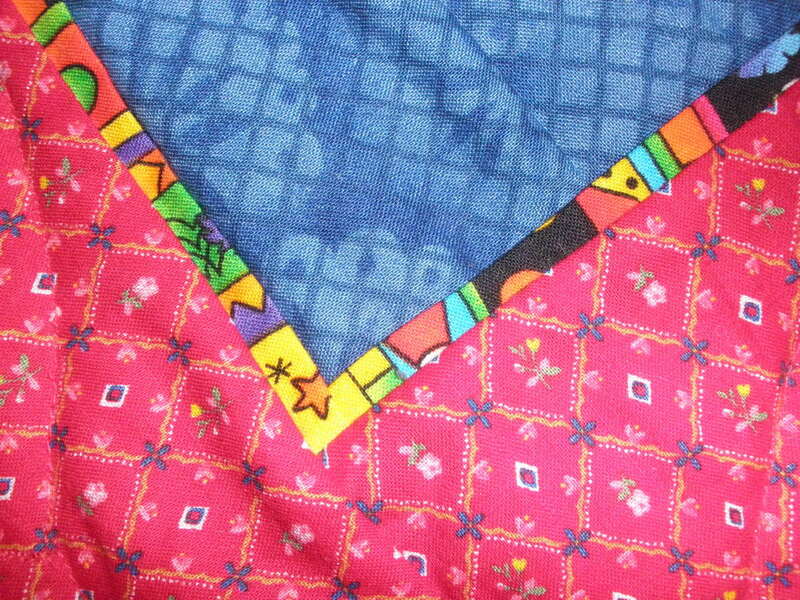 Pins or stitches are placed every 4-5 inches until the entire quilt is basted. Excess batting and backing fabric may be trimmed at this point for ease in handling. Leave the standard 2" margin beyond the quilt top for the batting, and an additional 2" margin beyond the batting for the backing fabric. Pins are placed about every 4-5" (a hand's width) apart when basting. Hand basting with a milliner's needle and heavier thread serves the same purpose as pins. Stitches are also 4-5" apart. Basting stitches, by the way, do not need to be knotted, as I have seen in one video. You simply leave a good four or five inches of thread topside and make long (about 4"), slanted stitches to hold the layers together. Some quilters use a tag gun instead of pins. You do have to cut the plastic strands, though, which then cannot be reused. 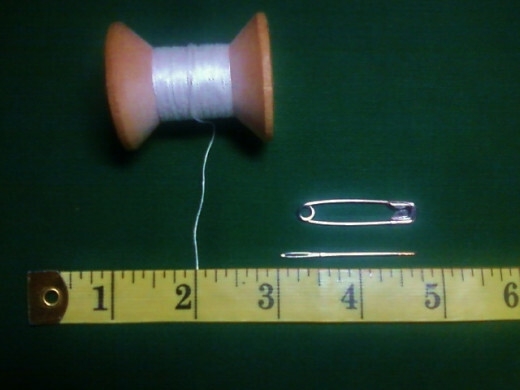 The materials used in basting: size 8 mercerized thread, medium safety pin(s), and a tapestry needle. The unlinked photos and sketches in this article are my own work.